The largest airport in Michigan, Detroit Metro Airport is a key aviation hub for the region and boasts one of the longest terminal buildings in the world. Our guide to the airport includes important information regarding terminal facilities, public transportation and nearby accommodation. There are plans for a light rail connection between the airport and the city. Customer service representatives in green waistcoats can be found around the terminals and provide information about airport services, local hotels and public transport. There are also customer service points situated throughout the airport. 'Skycap' volunteers are on hand to provide further assistance. The airport is located just off John D. Dingell Drive. 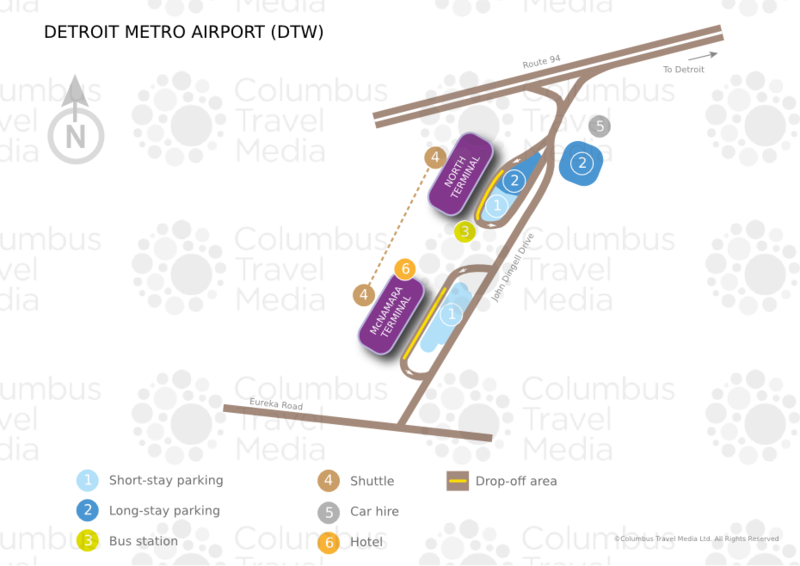 Detroit Metro Airport can be accessed from two major interstate motorways: Interstate 94 – turn off at exit 198 (which turns into Rogell Drive and then John D. Dingell Drive); and Interstate 275 Eureka Road – turn off at exit 15 (onto Eureka Road and then John D. Dingell Drive). A free shuttle bus service operates between the North and McNamara Terminals. Owing to the length (1.6km/1 mile) of the McNamara Terminal, an express tram service runs from end to end. Detroit Metro Airport is situated 32km (20 miles) southwest of Detroit. Bus:SMART bus (tel: +1 866 962 5515; www.smartbus.org) runs local services (bus 125 from the McNamara Terminal, and 125 or 280 from the North Terminal) to central Detroit (journey time: 40-50 minutes; fare: US$2) from outside the lower level of both terminals, near the ground transportation offices. Public buses also run to the airport from the Ann Arbor area (tel: +1 734 707 7247; www.myairride.com). The pre-reserved fare is $12 one-way, $15 unreserved, and the journey time is around 50 minutes. Taxi:Taxis are available from Metro Cars (tel: +1 800 456 1701; www.metrocars.com) and Metro Cab (tel: +1 734 997 6500). Fares to downtown Detroit are roughly US$45-60. Rail:Amtrak (tel: +1 800 872 7245; www.amtrak.com) serves Dearborn Station, 19km (12 miles) to the northeast of Detroit Metro Airport. ATMs can be found throughout both terminals. Currency exchange services are located in the main concourse of the McNamara Terminal and in the arrival and departure areas of the North Terminal. There is a large choice of cafés, bars and restaurants at Detroit Metro Airport that are distributed throughout both terminals. Among the options are Mexican and Japanese restaurants in the McNamara Terminal and a pizza place in the North Terminal. Vending machines offering snacks and drinks are also available. There are numerous shops at Detroit Metro Airport. The McNamara Terminal has the most choice, with options ranging from jewellery and fashion boutiques to a golf accessories retailer. Duty-free is available for international passengers. The North Terminal's offering is mostly limited to newsagents and bookshops, although there is a gift shop and a confectioner. There are lost property services in both terminals (tel: +1 734 942 3126 for security screening areas or +1 734 942 3669 for all others). Luggage lockers are not currently available. Baggage trolleys are available for a fee. Other facilities at Detroit Metro Airport include 24-hour medical assistance, 'quiet' rooms, baby changing facilities, shoeshine services and children's play areas. There are limited business services in the terminals, but the Westin Detroit Metropolitan Airport Hotel (tel: +1 734 942 6500; www.westindetroitmetroairport.com), which is situated within the McNamara Terminal, offers a fully equipped business centre, 34 meeting spaces and a large ballroom. The nearby Detroit Metro Airport Marriott (tel: +1 734 729 7555; www.marriott.com) also offers extensive meetings facilities, while The Courtyard Detroit Metro Airport Romulus (tel: +1 734 721 3200; www.marriott.com), located just beyond the North Terminal, has two meeting rooms for up to 40 delegates. Free Wi-Fi internet access is available throughout Detroit Metro Airport. Public telephones are also available throughout the terminals. Detroit Metro Airport is fully accessible to those with disabilities. In-terminal facilities include TDD/TTY telephones, which are installed in both terminals, animal relief areas for those with guide dogs and wheelchair accessible toilets. Reserved disabled car parking spaces are available in all of the airport's car parks, while wheelchair-accessible shuttles (tel: +1 800 642 1978) are available for transfers between the car parks and terminals. Disabled passengers are advised to contact the airport's General Information Desk (tel: +1 734 247 7678) for further information while at the airport, while SkyCap porters are on hand to help. Passengers should contact the relevant airline prior to travel to request wheelchair assistance. There are several car parks offering hourly, daily and long-term parking. Short-term parking is located opposite the terminals in multistorey car parks. Long-term outdoor parking is available in the car park opposite the North Terminal and in the uncovered Green Lot, which is also close to the North Terminal. A free shuttle service is available between all terminals and car parks. Additional facilities include a valet parking service and a waiting area for those picking up arriving passengers. Charging points for electric vehicles are available. For parking availability and information, call the parking hotline (tel: +1 800 642 1978). Car hire companies represented at Detroit Metro Airport include: Alamo, Avis, Budget, Dollar, Enterprise, Hertz, National and Thrifty. Offices for these providers are located close to the North Terminal on Lucas Drive, to which courtesy shuttles operate.